Astrid and I fly to Malta today and return on the 18th. Ginnie Hart: Many kind thanks, Martine. And WELCOME to Shutterchance! Have a wonderful photographic time. Ginnie Hart: You know we will, Michael. Thank you. I quite like this extreme twiddle, Ginnie...I think you chose the material well. Ginnie Hart: Thank you, kind sir. Sometimes I just can't resist. haha, tricky wabbit, a windmill on a BOAT! have fun you two!!! Ginnie Hart: Tricky wabbit. HA! I like that, Elaine. Have a wonderful time, you two! Ginnie Hart: Thank you, Elizabeth. This reminds me of when we colored a piece of white paper and then painted black poster paint over it to then make an etching. Remember??!! Have a blast!!! This image is the perfect send off! Ginnie Hart: I love that you think I'm normal. HAHAHAHAHA! But then, you're all that matters, so who cares what anyone else thinks! I can indeed, Ginnie. BON VOYAGE! Ginnie Hart: Thank you, Lisl. We are now at our gate, waiting for our departure. YAY. Not only is this a ghost boat but a ghost windmill too! Ginnie Hart: Ghosts of Hollandshire, Chris, as we fly off to another country. We are so ready! Oh, you twiddlemaster - enjoy your travel and come back with lots of pictures! Ginnie Hart: Sweet, Philine. You KNOW we both will come back with loads of images!!! Have a super holiday Ginnie, and come back with armfuls of photographs. Ginnie Hart: I promise to do so on both counts, Chad! Ginnie Hart: Now I'll have to Google that, Alan! So very well done Ginnie! Enjoy your stay in Malta. Ginnie Hart: Thank you and thank you, Richard. We plan to have a GREAT time! You are psyched and psychedelic. Have a wonderful time. Ginnie Hart: You nailed it, Mary! This just set me mood into disco mode! >Talk to me. Show AND TELL. Easy tiger. I will after April 18th, cos I had already scheduled all my holiday posts quickly upon my return from Malaysia and Japan. Absence does make the heart grow fonder, doesn't it? Ha! Ginnie Hart: Whew, LC. You had me worried there. So glad to know you'll be back to normalcy at the same time we return from Malta. electrifying shot, Ginnie. looking forward to tonnes of cool shots. do have a great time, the two of you! Ginnie Hart: We thought of Mick often while we were there, Bill. And to think he has never been to The Three Cities across the harbor from Valletta! We need to catch up with him and compare notes, now that we've been there. It was a FABULOUS trip! As the old saying goes, two for the price of one. Have a great time you two. Ginnie Hart: Double the pleasure, double the fun! Indeed, Brian. Thanks. We had a GREAT time. Enjoy and have a great time. Great idea to take xtc before leaving - will make the trip short. Ginnie Hart: LOL, Louis. We were "sane" the entire time and loved it all! Ginnie Hart: Thanks, Peter. Sometimes we just have to have fun! Ginnie Hart: It's fun to play around, JP. Ginnie Hart: It's fun to play again like when we were kids, Marie, right?! Ginnie Hart: We had a FAB time, Cherry. I can totally picture you and Hubby visiting there, if you haven't already. Ginnie Hart: Thanks, Joshi. Sometimes it's fun to play around! Have fun... ... I never think of boats passing so close to a windmill. But then again... I never get to see them. 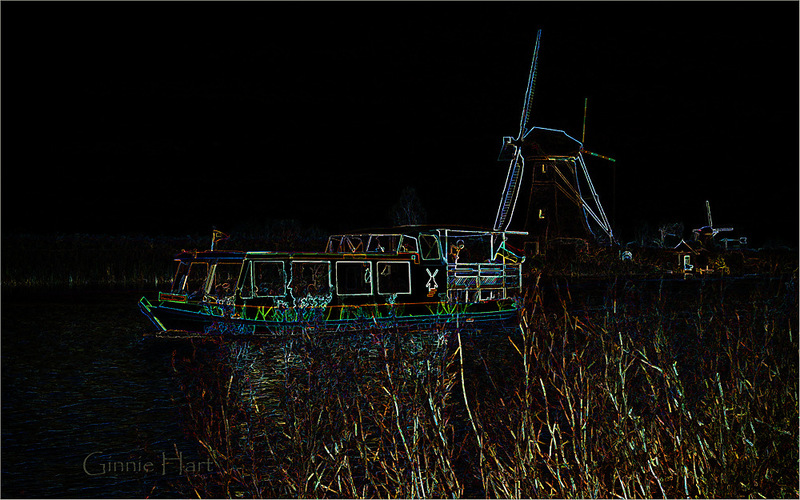 Ginnie Hart: There are a couple of canals that run alongside of the 19 windmills at Kinderdijk, Jacquelyn, with tourist boats always at the ready. You'd love it. Bring back lots of goodies for me from Malta, yeah. Ginnie Hart: HA! I knew you'd miss me, LC. Wait till you see all the goodies I found for you! Ginnie Hart: We're back after a GREAT visit, Emily. Starting on Friday I'll be posting about the trip!! !